Cordeira, J., F. Ralph, A. Martin, N. Gaggini, R. Spackman, P. Neiman, J. Rutz, and R. Pierce, 0: Forecasting Atmospheric Rivers during CalWater 2015. Bull. Amer. Meteor. Soc., 0, doi: 10.1175/BAMS-D-15-00245.1. 84-h NCEP GFS gridded forecast of IVT magnitude (kg m-1s-1 and direction; initialized at 1200 UTC on 3 February 2015; (b) as in (a), except for the verifying analysis of IVT magnitude and direction at 0000 UTC 7 February 2015 with overlaid draft flight track of the NOAA G-IV aircraft (c) GPS-derived IWV (mm) at 0015 UTC 7 February 2015. Atmospheric Rivers (ARs) are long and narrow corridors of enhanced vertically integrated water vapor (IWV) and IWV transport (IVT) within the warm sector of extratropical cyclones that can produce heavy precipitation and flooding in regions of complex terrain, especially along the U.S. West Coast. Several field campaigns have investigated ARs under the “CalWater” program of field studies. The first field phase of CalWater during 2009–2011 increased the number of observations of precipitation and aerosols, among other parameters, across California and sampled ARs in the coastal and near-coastal environment, whereas the second field phase of CalWater during 2014–2015 observed the structure and intensity of ARs and aerosols in the coastal and offshore environment over the Northeast Pacific. This manuscript highlights the forecasts that were prepared for the CalWater field campaign in 2015 and the development and use of an “AR portal” that was used to inform these forecasts. The AR portal contains archived and real-time deterministic and probabilistic gridded forecast tools related to ARs that emphasize water vapor concentrations and water vapor flux distributions over the eastern North Pacific, among other parameters, in a variety of formats derived from the NCEP Global Forecast System and Global Ensemble Forecast System. 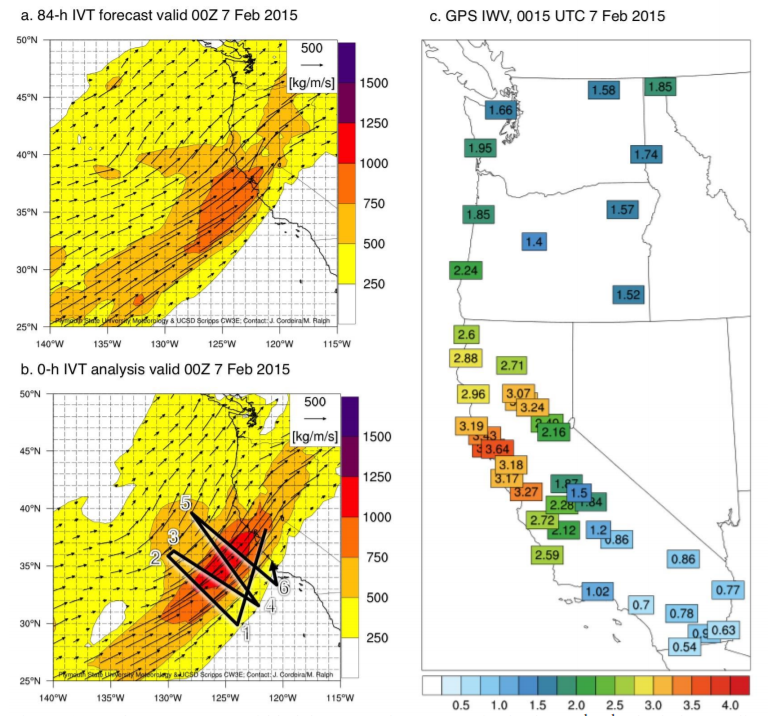 The tools created for the CalWater 2015 field campaign provided valuable guidance for flight planning and field activity purposes, and may prove useful in forecasting ARs and better anticipating hydrometeorological extremes along the U.S. West Coast.